Come and learn French in full immersion. We offer tailored made immersion programs for adult learners in several places of France. Choose your private teacher and destination in France where to learn the language at your own pace. What is a French Immersion? An immersion course is one of the best ways to learn a language by studying abroad for an intensive period. By signing up to one of our immersion courses you will travel to France to study French on a residential course with one of our certified teachers. Courses can vary in length. You can plan an intensive one or two-week French immersion program or stay longer, depending on your requirements. Our immersion programs are particularly suitable for adults because they answer to their needs. Our teachers offer all the comfort adults are used to. They welcome you into their house, provide you with comfortable accommodation, cook for you and share meals with you. The French lessons are developed to meet personal needs such as improving conversational skills, preparing for exams, being able to use French at work, or learning more about French culture and everyday life. Our students are generally people in their 20s and 70s with different backgrounds – such as business executives – students at University – retired with passion of French – and different levels of French. They want to travel to France and improve their French. They also love to meet local people and have time to relax. Their motivation to learn French is for pleasure, leisure, work, exam preparation and to discover the area. They come by themselves or with their partner and family. That is why our immersion programs are perfect: they are personal, authentic, intensive and flexible. Why study French in one of our immersion programs at the teacher’s home? Studying on an immersion course will allow you to learn French fast. Whilst living in French speaking environment you will be able to effectively balance time for active learning of the language with leisure and natural interaction with French speakers. In other words, you will be encouraged to learn French without feeling the effort of studying a language! Our focus is on the quality of teaching. All our teachers are French native speakers with teaching qualifications and lengthy experience. They will be able to offer you a tailormade teaching curriculum based on your current language level. You will take advantage of very personalised French lessons. Our immersion programs host one-to-one classes to small groups of students, ensuring you can always benefit from a private teaching style. Although the lessons provide solid grammatical knowledge, you will also practice communication in French. So, you will swiftly develop confidence in holding spontaneous conversations with local people. A language immersion is also a holiday! We will make sure this experience is enriching for your French vocabulary and language skills and will also be, first and foremost, a pleasurable time for you to spend with welcoming people in amazing locations. Our teachers will also be your private tour guides. They are all passionate and knowledgeable about their region and will love to accompany you for many activities such as tours, hikes, cooking classes, wine tasting and sightseeing. Our French immersion programs are available in different places of France, depending on the teacher’s locations. We always make sure our locations can offer you the best travel and holiday experience as well as a place to learn the language. Remember, this is also your chance to discover and visit great places! We are regularly expanding our network of teachers to be able to offer you a wide range of locations in France where to go on immersion homestays. The majority of our courses are currently in the South of France, in the regions of Provence-Alpes-Côte d’Azur and Languedoc-Roussillon. These are renowned places in France with beautiful natural landscapes and rich cultural heritage. Our residential immersion programs are organised as a homestay at your own teacher’s home where you will be welcomed. You will be able to enjoy your stay in a friendly private home and socialise in a relaxed environment. You will enjoy living in an authentic French setting and get to experience the day to day lifestyle by sharing meals, visiting the surroundings and discovering local culture and traditions. Your host will cater for all your needs and provide you with the most comfortable accommodation in your own private double or single bedroom. 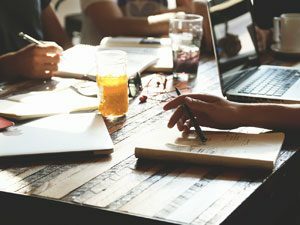 How can I book my immersion course? Your immersion course can be extremely flexible. Tell us what would be your ideal program in terms of teaching level, accommodation, area and length of stay and we will meet your expectations. Our programs are very flexible and include personalized French courses, accommodation at the teacher’s residence, meals shared with your teacher, and activities to discover the area. Your teacher can pick you up at the nearest train station or airport as requested (optional), and will accompany you for special activities such as kayaking, visiting museums (you will just have to pay for the tickets). Once you have selected your location and length of your French immersion course we will make the practical arrangements for you to join in due time –we will send you an agreement with all the details to book your stay. As we are a group of private teachers, the price of the course will be arranged directly with each one of us. No extra fee for the online booking service is required. Study French and live the authentic French lifestyle at Fanfan’s home. Your teacher is glad to provide you with personalized lessons of French in her cozy chalet situated in the heart of the village. Learn French with Immersion Homestay in a small medieval town in Burgundy. Live the French lifestyle at Maryse’s home, a graduate teacher who will provide comfortable accommodation in a charming and typical house. 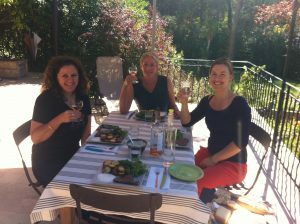 Learn French in immersion and live the authentic French lifestyle at Christine’s home, Your teacher provides you with personalized lessons of French + comfortable accommodation in her lovely flat situated in the city center to discover the stunning Aix en Provence. Nice, the French riviera, perfect to learn French at your teacher’s home. Coralyne is glad to welcome you in her lovely flat situated five minutes from Nice downtown. 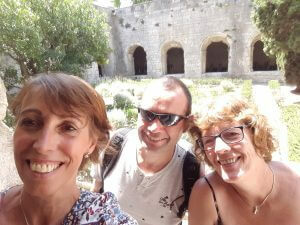 Learn French with Immersion Homestay in the gorgeous Luberon in Provence. Live the French lifestyle at Françoise’s home, a graduate teacher who will guide you to discover this picturesque area. Ah, Paris! The ideal place to learn French. Your French teacher Claude will be glad to welcome you in her lovely flat situated in the heart of the City of Light. Learn French with your teacher in Lille in total immersion. You benefit from private lessons with Caroline, your teacher. Learn French with an authentical Immersion homestay in Castelnau le Lez, a town just separated by the river le Lez from the famous city of Montpellier. Come with your family or friends and improve your French at Benedicte’s home. Your teacher is glad to welcome you in her stunning home situated in the heart of the village.